Dhira Krishna Prabhu protecting happily Srila Gurudev with an umbrella. 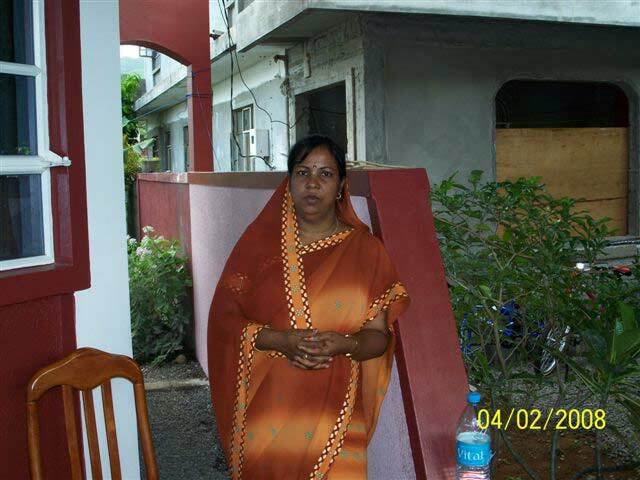 Please accept my most respectful obeisances to all the readers. 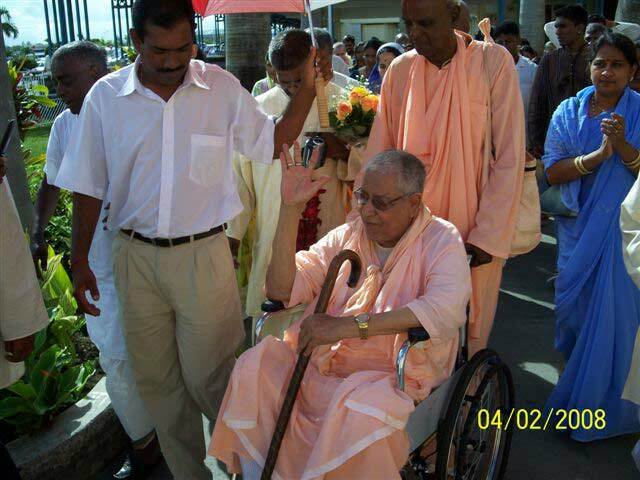 All glories to our beloved Srila Gurudev Srila Bhakti Sundar Govinda Dev-Goswami Maharaj who is blessing Mauritius by his visit. At last our dream has become true. 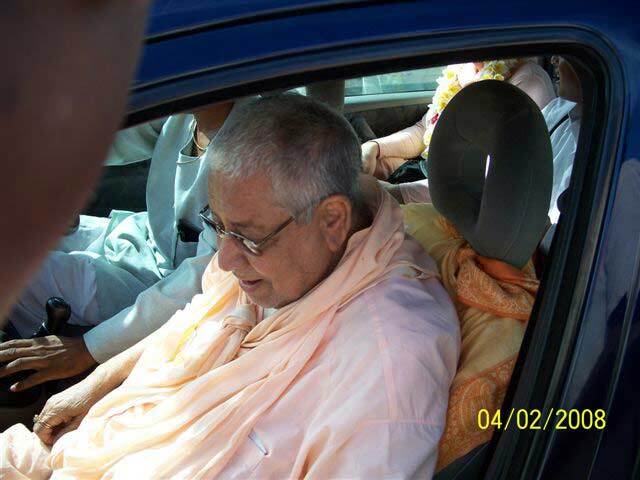 Srila Gurudev is in Mauritius and is sharing his timetable with members of the Vaishnava Seva Society. We were all at the airport to see Srila Gurudev land along with his dear associates. Unexpectedly we didn't know that His Holiness Siddhanti Maharaj and His Holiness Avadhut Maharaj would not arrive at this time, and we miss their association. Srila Gurudev was greeted by long, enthusiastic chanting of kirtans by his disciples. From the Premium VIP Lounge to the exit door Srila Gurudev bestowed his blessings to all peoples passing in front of him. Srila Gurudev did not accept garlands on this occasion but later explained it is because of an allergy. Sri Anandamayi Prabhu drove Srila Govinda Maharaj directly to Dipta Krishna Das' place where his mother greeted Srila Gurudev with a song in Tamil saying that "Come Krishna! Come! Please bless our place by your divine entrance! You are at the same time Krishna and you are Rama as well -- please come in!" A short Guru Puja was then performed by Sri Haripad Prabhu followed by a short talk given by Srila Gurudev succeeded by His Holiness Bhakti Sudhir Goswami Maharaj. 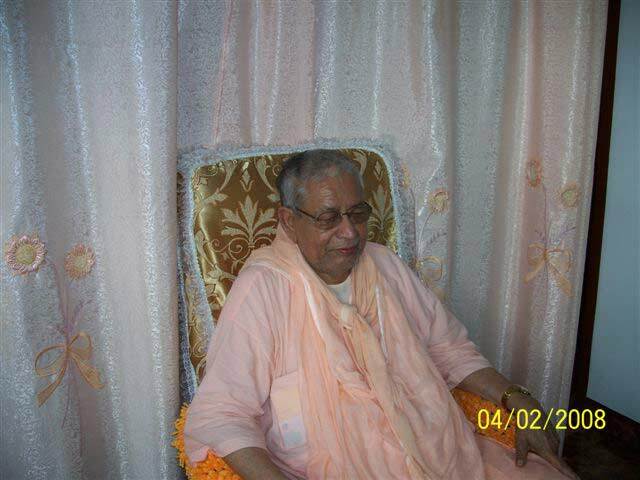 Srila Gurudev said he would give darshan on the following morning, health permitting. 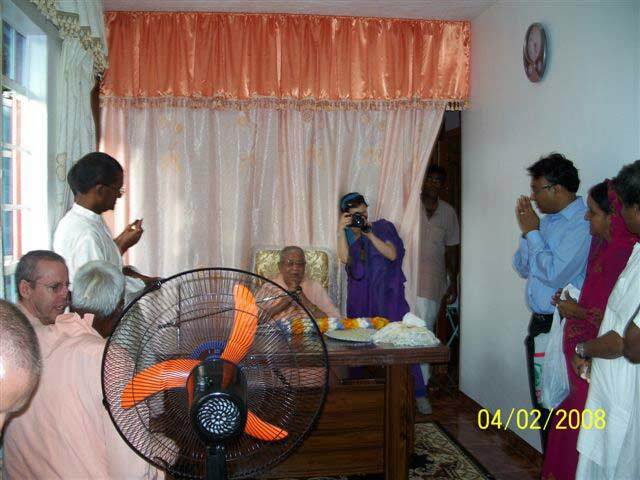 Devotees here in Mauritius are very motivated with this visit of Srila Gurudev which has been eagerly awaited for a long time. 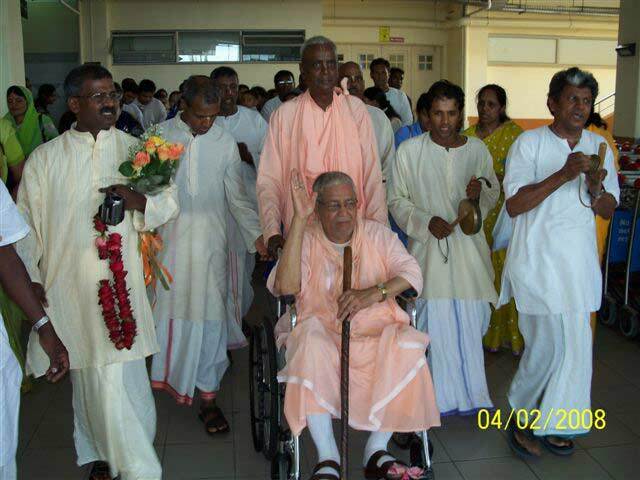 At the airport Srila Govinda Maharaj blessed everyone by his glance. All the way until the gate at the airport Srila Gurudev gave his blessings. 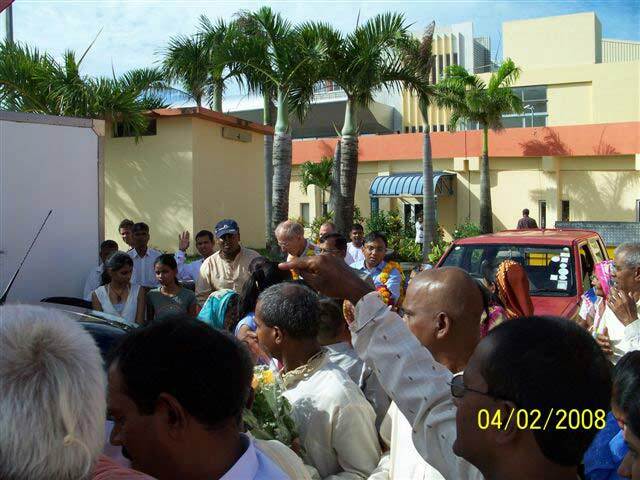 Devotees from all sections of the island were present to greet Srila Gurudev after a long pause of nine years since he last visited Mauritius in 1999. Arriving at Dipta Krishna Prabhu's house. Everyone is eager for a glimpse of His Divine Grace. 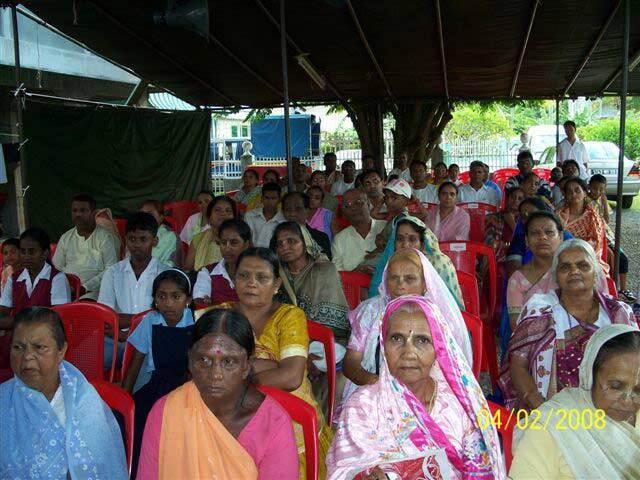 Srila Bhakti Sundar Govinda Dev-Goswami Maharaj seated before the many gathered devotees. Jamuna Priya Devi Dasi taking pictures for her verandaviews.com website. Listening attentively to Sripad Bhakti Sudhir Goswami Maharaj's talk. A pandal extends outside Dipta Krishna Prabhu's home. 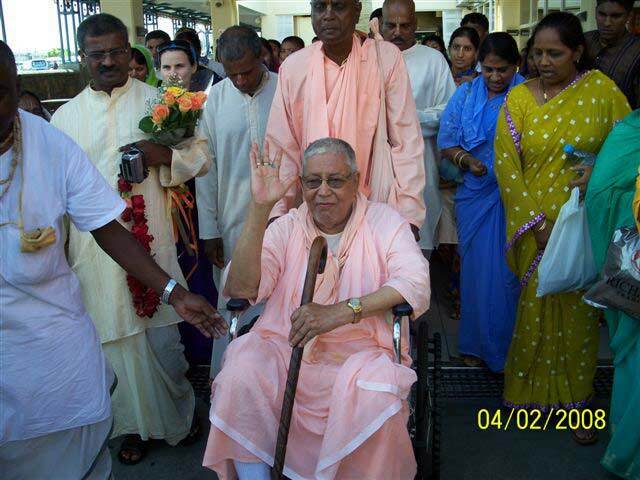 All eyes are fixed on Srila Gurudev. Neelanjana Devi Dasi welcoming the devotees. http://scsmath.com | Main Centres | What's New?